It’s literally a square filled with numbers. Yes, it’s that simple! What numbers are in it? The numbers are normally sequential. Younger children will often use a number square with numbers from one to 20. You'll also commonly see number squares from one to 100. The numbers are typed in numerals (1, 2, 3 etc). 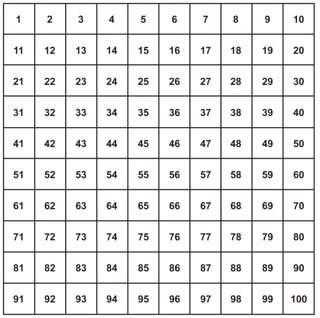 You might also see number squares called a ‘100 grid’ or a ‘multiplication grid’; the latter specifically helps children with their times tables. Not all number squares start at the number ‘1’. Some will start with different numbers, for example if your child is learning about hundreds, tens and ones. Lots of games (like Snakes and Ladders) use number squares, so your child is likely to be familiar with the concept from a very young age. How does a number square help learning? It's a really simple maths aid which helps children do addition, multiplication and subtraction. Children can use the grid to count up or down a certain amount of numbers and also to count ahead to find the next multiplication or sequence of numbers and to identify prime numbers. The squares can be shaded or coloured in which makes it more fun for children. Number squares can also be used to help children recognise patterns, such as sequencing (where the count goes up in a certain amount of numbers each time, for example, in times tables). How are number squares used in KS1 and KS2? A number square helps children in Key Stage 1 to count to 100 so that they were aware of the order of the numbers and what each one looks like. Children in Key Stage 1 also need to learn to count in 2s, 5s and 10s and a hundred number square is very useful for teaching them these skills. Often, children are asked to shade multiples of 2, 5 or 10 to help them see the numbers that they are counting. Once children go on to learn other times tables in Key Stage 2 the number square can again be used to shade multiples of 3, 4, 6, etc. Number squares can be used for adding and subtracting from a number. It can be a good idea to show children how to count on ten (or add ten) from a number on a number square by counting in ones. You can then show them that a quicker way to do this is just to move down one row on the number square. This makes it clear that when ten is added to a number only the tens digit changes. A blank number square or hundred chart can be an excellent tool to explain decimals to children (this concept is introduced in Year 4). You can explain that the number square represents 'one whole' and that the whole is split into 100 equal small squares. 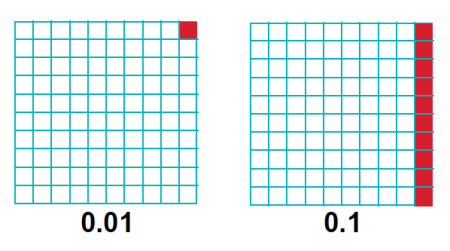 If you colour in one of these small squares you are showing 0.01 which is one hundredth. If you colour in ten of these small squares you are showing 0.10 (we knock the last 0 off, so it becomes 0.1) which is one tenth. In Year 5 children go on to learn percentages, so a hundred number square may be useful to show equivalence between fractions, decimals and percentages (see above). So what's a number line? What it says on the tin: a line of numbers. Children use number lines when learning basic addition. The numbers are written in a line and using a finger, or a counter, children can count in 'hops' to get the correct answer to a simple sum. Your child will almost certainly bring home examples of both number lines and number squares to use with their maths homework. We have a selection of number squares, number lines, number ladders and blank hundred charts for you to download and print for at-home maths practice.